The Letitia top in sumptuous midnight taffeta is charming. She has the most wonderful ruffles at her neckline and waist, gathered to perfection to look like strings of petals. Letitia has loose short sleeves for the comfiest fit. The skirt is made of four panels to give extra volume and neatly gathered to the bodice. Tunic length, Letitia is versatile for day and night. 5 little Cabbages and Roses engraved buttons fasten down the centre back. Unlined, Letitia has neat fitted shoulders and a slightly A-line bodice. The dreamy skirt and ruffles makes for a loose wafty dream. 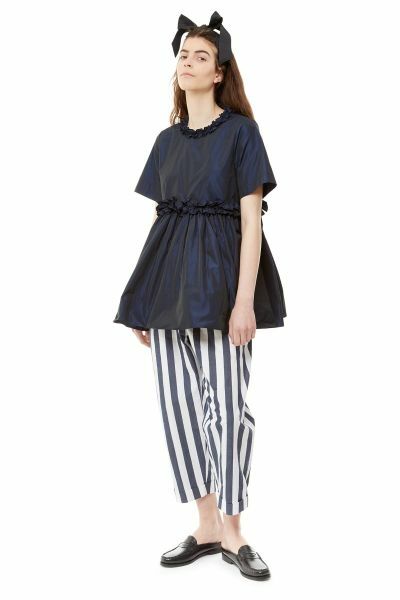 The Letitia Top is made from heavenly paper like taffeta woven in Spain. Letitia was made in Hertfordshire. 100% Polyester. Caring for your Top. We recommend that Letitia be washed by hand using Ecover Delicate Laundry Liquid. Can be dry cleaned, if you must, with an ecologically friendly dry cleaner, but please do not put in the washing machine. Press with a cool iron. Please do not bleach or tumble dry Letitia.